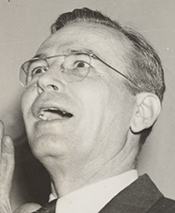 PATRICK, Luther, a Representative from Alabama; born near Decatur, Morgan County, Ala., January 23, 1894; attended the public schools, Louisiana State University at Baton Rouge, and Purdue University, Lafayette, Ind. ; in 1918 was graduated from the law department of the University of Alabama at Tuscaloosa; during the First World War served as a private, assigned to the Army training detachment and to the Central Officers' Training School, from June 14, 1918, to December 4, 1918; was admitted to the bar in 1919 and commenced practice in Fairfield, Ala.; city attorney of Fairfield 1920-1922; author of many poems and books; began career of radio commentator in 1925; assistant attorney general of Alabama 1927-1929; assistant United States district attorney of the northern Alabama district in 1933 and 1934; elected as a Democrat to the Seventy-fifth, Seventy-sixth, and Seventy-seventh Congresses (January 3, 1937-January 3, 1943); unsuccessful candidate for renomination in 1942; served as a consultant to the War Production Board in 1943 and 1944; elected to the Seventy-ninth Congress (January 3, 1945-January 3, 1947); unsuccessful candidate for renomination in 1946; resumed law practice in Birmingham, Ala.; delegate to the Democratic National Convention in 1956; died in Birmingham, Ala., May 26, 1957; interment in Elmwood Cemetery. Papers: 1932-1957. 1 foot (microfilm). Originals privately owned. Correspondence, speeches, clippings, printed matter, scrapbooks, congressional references, and photographs. Finding aid in repository. Duplicate of material at Birmingham Public Library. Oral History: 60 minutes. In Biographical and Political History Oral History Collection. Papers: 1932-1957. 1 foot (microfilm). Originals privately owned. Correspondence, speeches, clippings, printed matter, scrapbooks, congressional references, and photographs. Finding aid in repository. Duplicate of material at Auburn University. Patrick, Luther. Friends, Neighbors, Kinfolks. Prairie City, Ill.: The Press of James A. Decker, 1946. ------. Goosepocket. Illustrated by Hubert Harper. Birmingham, Ala.: Vulcan Press, Inc., 1955. ------. Hope Ye're Livin' An' Doin' Well. Birmingham, Ala.: A.H. Cather Publishing Company, 1936.